Musée Saint Joseph Museum Inc. was established to preserve the history and culture for the Rural Municipality of Montcalm for the enjoyment of the residents and of the visitors to the area. The museum features a historical village, agricultural village, a tourism center and a campground. Buildings include houses, a school, a church, a general store, typical farm buildings, exhibits of tractors and other agricultural machinery, a blacksmith's shop, a leather workshop, a word-working shop, a significant collection of stationary engines and heritage display of the Manitoba sugar beet industry. The Perron House, dating between 1865 and 1870, is built with wooden beams squared with a side axe and adze and features furniture from the 19th century. The Moquin House, dating back to 1905, was built by a pioneer of the Saint-Joseph community with furniture dating between 1915 and 1930. The Montcalm Exhibit features a large collection of domestic and agricultural artifacts. The Plankey Plains Ukrainian Catholic Church, built in 1938, is reminiscent of its era with no electricity and is heated by a wood stove. The Union Point School, built around 1890, contains educational artefacts dating between 1940 and 1950. 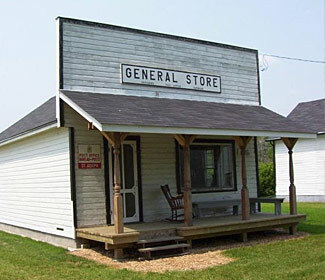 The General Store, a reproduction of the early era stores, contains many artefacts. The store also features a hardware department, butcher shop and post office. The Perron Pavilion has twenty rooms depicting various themes - a kitchen, a dining room, a bedroom, sport, health, religious practices, laundry and a sewing room. One room is reserved for artefacts of the Eaton’s store. The milking shed, built in 1901, has artefacts related to the history of the dairy industry on small farms. Two warehouses contain many pieces of machinery related to the transportation industry of by-gone years. The barn comes to life every year for the Montcalm Heritage Festival with animals from a hobby farm. The Delorme Woodworking Shop is a reproduction of a carpentry shop from the early twentieth century. The Sarrasin Leather Workshop displays tools necessary for the production and repairing of leather articles such as horse harnesses. The stationary engine shed has one of the largest collections of its kind in western Canada. It includes a large stationary engines that was used to drain water from the basement of the James Avenue Pumping Station in Winnipeg in 1924. Safely sheltered in the tractor shed are many tractors and other agricultural machines (tractors, seeders, threshing machines) dating from the 1920s to 1940s – brands include Titan, McCormick, Case, International, Massey and, of course, John Deer. The Sugar Beet Producers Display Building is dedicated to the history of the sugar beet industry, which was significant in the region from 1940 to 1996. Guided tours are available on request. In addition to historical attractions, the museum site also features a walking trail, playground, campground and two baseball diamonds. 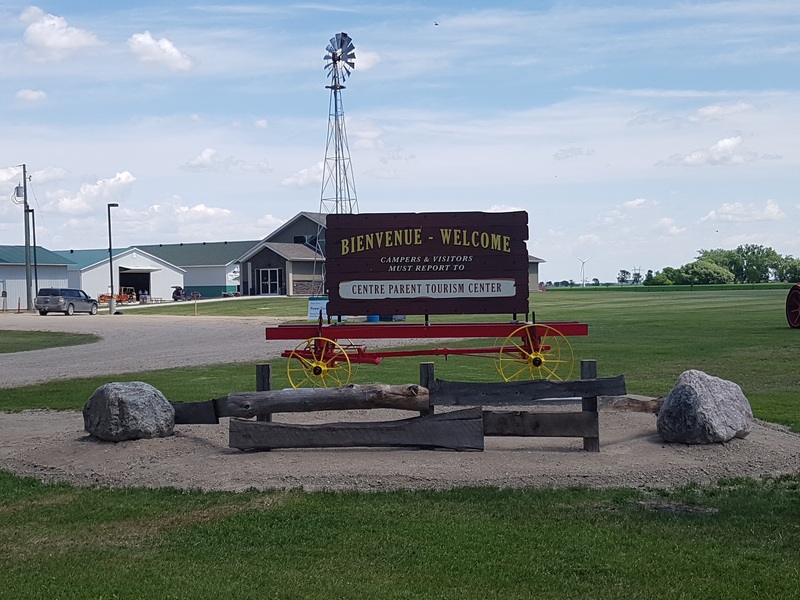 The Centre Parent Tourism Centre, a timber-frame structure decorated with amazing murals by Manitoba artist, Hubert Theroux, is open year-round and introduces highlights of the museum's collections. The museum’s 45,000 artifacts are normally housed in the buildings of the historical and agricultural villages, which are only open to the public during the summer months, located at 14 Etienne Ave Saint Joseph, MB. The center has a gallery for artifacts and travelling exhibits, a meeting room, a workshop and a gift shop. A permanent gallery is dedicated to the unique Laurent Fillion collection of cameras. For more information or to book a tour, please call 204.737.2244 or email or museestjoseph@gmail.com. Camille Mulaire will be happy to answer your questions.